I just updated to OS X v10.9 (Mavericks), and now whenever I start up any of my emulators, as soon as the emulator starts up, my entire computer freezes with a spinning progress indicator in the center of the screen (not a beachball, the progress indicator is similar to what you see when shutting down, but the screen hasn't faded to grey). The only thing that works is to uninstall Intel HAXM / not use hardware acceleration. I'm guessing there's a bug with Mavericks and HAXM similar to what motivated the release for 1.0.6 of HAXM for OS X v10.8 (Mountain Lion)? The following crash report is indicating a kernel panic generated by HAXM. Intel released a hotfix for the Intel® Hardware Accelerated Execution Manager (HAXM). If you have installed HAXM on Microsoft Windows* 8.1 or OS X 10.9 you should install the Hotfix. We identified the root cause of this issue. The Intel HaXM team is testing an update to support newly released OSes (Microsoft Windows* 8.1 and OS X Mavericks*). Look for word on our upcoming update. Thanks for your replies. We are investigating into this issue at the moment. Please note that OS X 10.9 is not an supported OS version for the actual version of HAXM. I will update this thread as soon as I have new information or a fix/workaround is available. I assume we release a fix somewhere between a few days and two weeks. We know that a lot of people are waiting for the fix, so we try to release it as fast as possible. Great news: The hotfix is available for download! Please go to http://software.intel.com/en-us/articles/intel-hardware-accelerated-execution-manager/. There is a hotfix for Microsoft Windows* 8.1 and one for OS X 10.9. Let us know if the hotfix is working for you. Thanks all for helping us resolving this issue! It seems like problems will persist even if you install and run getting "HAX is working and emulator runs in fast virt mode." If you have Xcode open when running Android Studio, it appears that Xcode is reserving a partition for its simulator even if the sim isn't open. You might see a "No Connected Devices" in the "6. Android" tab but see it running in the DDMS. You might also see the "Emulator null 5556 [OFFLINE]" show up then loose connection and revert back to "Not Connected Devices." I've been using the HAXM emulator successfully for a while on my Mac Mini 4GB RAM machine, but as soon as I tried running the Nexus 10 emulator, I starting to see a ton of problems launching the app. The long and short of it is that you need to close/disable Xcode, VirtualBox, Hyper-V, or any other VM that uses virtualization technology to run the HAXM emulator and the default emulator efficiently. After closing Xcode, I was able to open the emulator with no problems right off the bat, most likely because of the the CPU restrictions of my system. For those of us using older Macs, in particular Core Duo 2 machines, I think there's still a problem. I have an early 2009 iMac with 8GB RAM running Yosemite (10.10.1) and I installed the 1.1.1 version of HAXM (tried both the version that Android SDK Manager downloaded and the one referenced above on Intel's site). I can run the older ARM images, but like many others who are having issues running the x86 images, e.g. Nexus 5, Nexus 6, it still hangs for me. HAXM driver does not support emulating a 64 bit system image on Intel systems based on Core microarchitecture (Core, Core2 Duo etc.). But, it seems like even trying to emulate a 32 bit system is problematic. NB: ARM images work fine. The hotfix (almost) solved it for me. After installing the hotfix my emulator was still not using HAXM. I had to uninstall the old version using the SDK manager. Once I did that I was able to get HAXM running. You can tell it is running by looking for the message in the startup window when you start a new emulator. 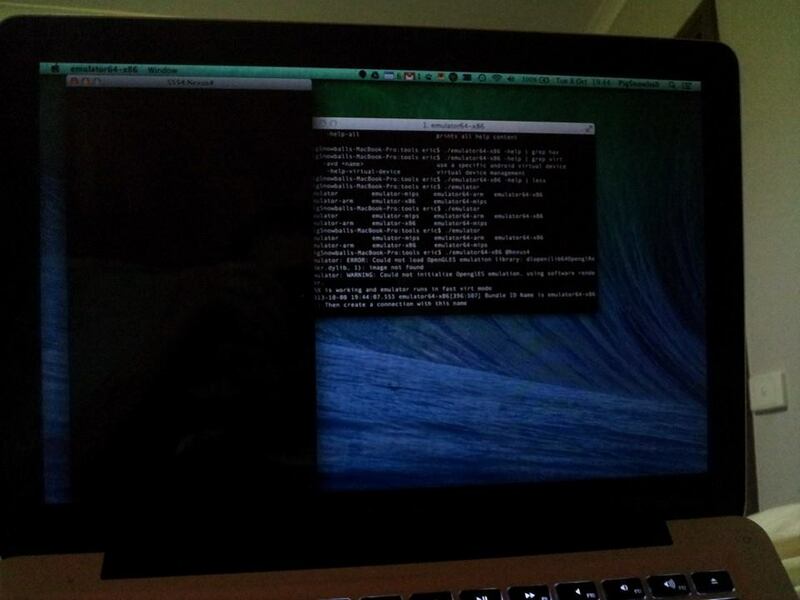 Hotfix worked on my Macbook Retina with 10.9. I installed the HAX from Android SDK manager version 3 and it froze on my AVD (x86 CPU using HOST GPU). I downloaded and installed the hotfix without uninstalling HAX version 3 (do a kextstat | grep intel to confirm the version). Not the answer you're looking for? Browse other questions tagged android macos android-emulator haxm or ask your own question. Why does Aptana not start on 13.10?